Although this is a mapping skills center game and lesson plan to teach cardinal directions, students will also practice following written directions, reinforce reading simple words, and sentences, and using fine motor skills. This lesson could be done by using a barnyard, a neighborhood, or a town, depending on the unit of study or theme you are teaching at the time. For sake of example, we will use a “map” of a farm. 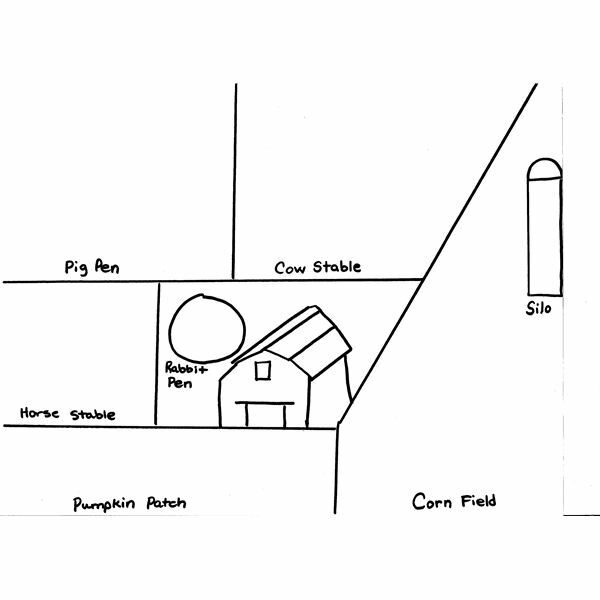 Given a map of a barnyard, students will follow directions to create playdough animals and pumpkins and place them where they belong. They will also place cardinal direction words where they belong. Create a farm map similar to the one shown below (click on the picture to enlarge). Include the farm, silo, and labels. You will want to include words like, pig pen, horse stable, cow stable, rabbit pen, corn field, and pumpkin patch or vegetable patches. Make it simple for young readers and include picture support, if necessary. The sample below can be copied onto green construction paper to resemble the grass. Also prepare the directions, answer key and question and answer sheet. Discuss barns and farms with students, during a farm unit. Show the students an enlarged farm map that you have created. Show the students directions that they will use for the activity. Teach cardinal directions, north, south, west and east. Read the directions with assistance from the students. Practice following the directions with the help of the class, and placing the words, north, south, west, and east in their proper places on the map. To use this as a center game, make the activity self correcting, by including an answer key that the students can use when they are finished. Create five pigs and place them into the pig pen. Create four cows and place them into the cow stable (and so on). To keep the activity from getting monotonous, change the numbers periodically. Older students can use the cardinal words, northwest, northeast, southeast and so on. Depending on the time of year and grade this lesson is used for, students can also create mathematical sentences with the values given. Given a different scenario (for example a town), can the students tell you the cardinal directions, north, south, west and east? Can the students place the correct number of animals, or objects in their respective places? Formally assess the students on the question and answer sheet. Kindergarteners will learn geography and mapping skills in this series of lesson plans.